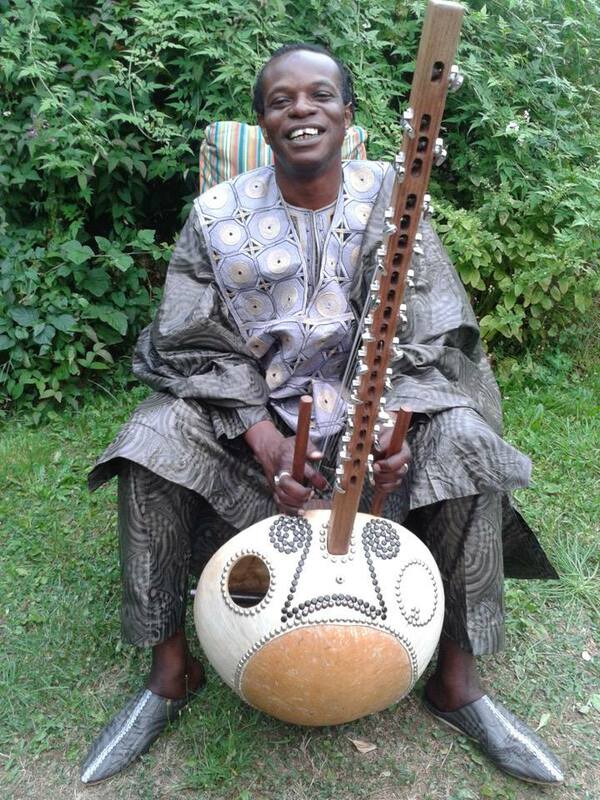 Virtuoso kora player and praise singer (griot) for hire. Jali Fily hails from Ziguinchor in the beautiful lush region of Casamance, Southern Senegal. Virtuoso kora player and praise singer (griot), Jali Fily hails from Ziguinchor in the beautiful lush region of Casamance, Southern Senegal. Fily is a Mandinkan griot. The Mandinka, a social group of approximately 4 million, live in and around Senegal, Mali and the Gambia. The griots are professional hereditary musicians who once advised and entertained the emperors and kings of Mali. These oral historians have for over 4,000 years handed down the knowledge, culture and history of the Mande people. 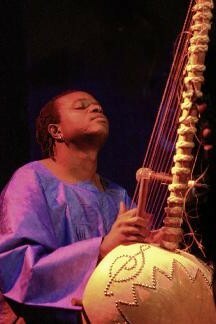 Fily was born into the famous family of griots – Cissokho – and was taught to play the kora (a 21 string African harp) at the age of 6 by his father Jali Kemo Cissokho and later by his older brother Solo Cissokho. 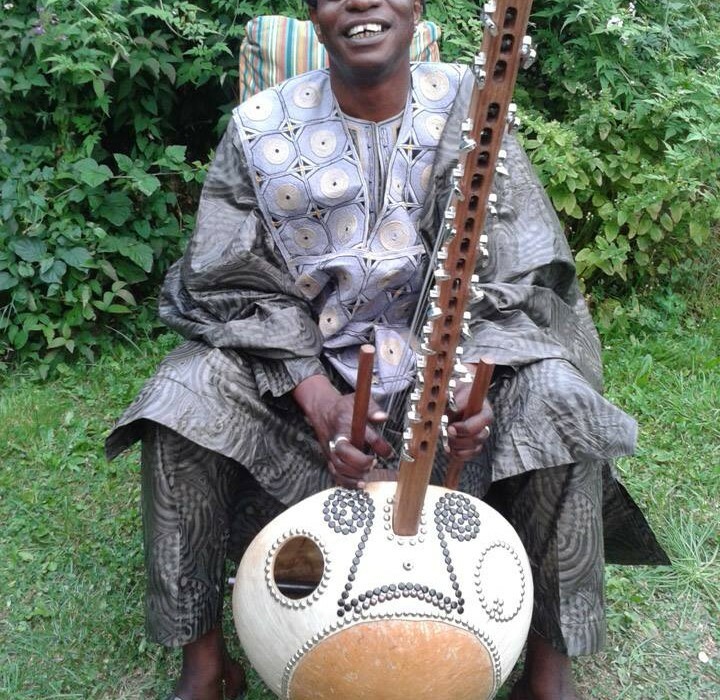 His mother, singer Bintou Konte Cissokho, gave him the historical stories and songs and soon he was performing at local ceremonies in the region. At the age of 13 he formed his own group, Coute Diomboulo, and later performed as a solo artist throughout southern Senegal. 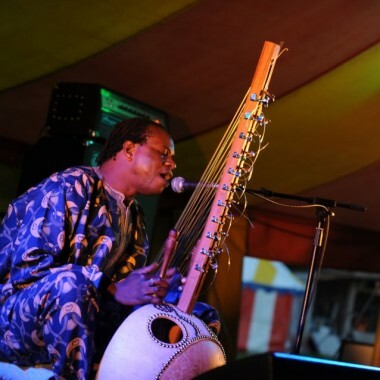 His compositions and skilful mixing of the rhythms of south and north Senegal eventually took him to the capital Dakar where he sang and played the kora in more commercial settings with other groups, superbly blending traditional skills with modern sounds. Fily was first invited to Europe in 2002 to tour with the family group founded by his brother Solo, Jalikunda – winner of the BBC3 World Music Award, 2004. His UK appearances have included the WOMAD, Glastonbury and Larmer Tree Festivals, the Oxford Zodiac (supporting the Kathryn Tickell Band), the Oxford Water Festival (“His music moved people to tears”) and Modern Art Oxford. He has also performed on David Attenborough’s BBC TV Documentary ‘Elephants’ for composer Will Gregory (of ‘Goldfrapp’ fame), and more recently for AR Rahman, composer of the score for ‘Slumdog Millionaire’. Now resident in the UK he has been working with the support of Oxford Contemporary Music, Oxford Brookes University and others. Fily is experienced in one-to-one, hands-on tuition and also group workshops for schools, universities and festivals. His sympathetic and adaptable approach provides empathy with all age groups, ranging from pre-school to adult. Available as a solo artist Fily is also interested in working with other world musicians. His versatility enables him to deliver not only his traditional music but to fuse easily with other diverse styles, such as classical, afro, cuban, blues and jazz. Fily has so far released 4 CD albums, the second, ‘Doumajoulo’ involving a number of other Senegalese musicians.